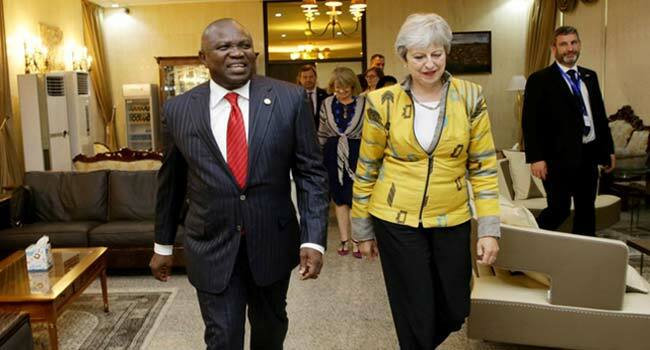 British Prime Minister Theresa May on Wednesday visited Lagos State. She was received at the Murtala Muhammed International airport by Governor Akinwumi Ambode, accompanied by his deputy, among other state officials. The Prime Minister and Governor Ambode later held a brief meeting at the presidential wing of the airport, discussing trade and business-related issues. Mrs May is expected to later visit Salvation Army Headquarters in Lagos and meet with some victims of modern day slavery. She is also expected to meet business leaders at FMDQ Security Exchange building in Victoria Island. Mrs May earlier arrived in Nigeria today and met with President Muhammadu Buhari at the presidential villa in Abuja.